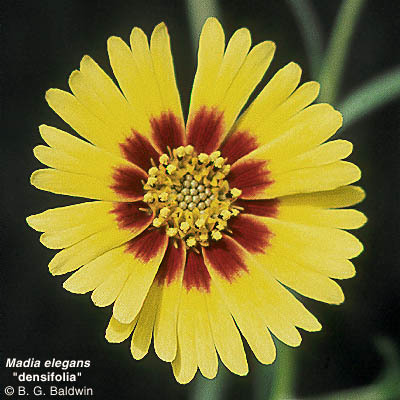 Phylogenetic and biosystematic findings led me to revise the generic positions of some tarweed (Madiinae) taxa previously placed in Hemizonia, Madia, and Raillardiopsis [see Baldwin, Novon 9: 462–471 (1999)]. To achieve a taxonomy of monophyletic genera, the circumscriptions of Hemizonia and Madia were narrowed, Raillardiopsis was abandoned, and genera were erected or resurrected for taxa removed from the three genera. Additional revisions, at the species and subspecies levels, were necessary in Blepharizonia and Hemizonia [see Baldwin et al., Systematic Botany 26: 184–194 (2001)]. Deinandra (Hemizonia) increscens subsp. increscens has been redelimited to exclude populations from Alameda County, now treated as a distinct species, Deinandra bacigalupii [see Baldwin, Madroño 46: 55–57 (1999)]. The types of Hemizonia congesta subsp. congesta and Hemizonia congesta subsp. leucocephala have been found to belong to the same taxon, with the name H. congesta subsp. congesta having priority. The name Hemizonia congesta subsp. congesta was misapplied in The Jepson Manual to representatives of H. congesta subsp. lutescens. Blepharizonia plumosa subsp. viscida is now treated as Blepharizonia laxa. Blepharizonia plumosa subsp. plumosa is now treated as Blepharizonia plumosa (no subsp. recognized). Centromadia (Hemizonia) pungens subsp. maritima and C. (H.) pungens subsp. septentrionalis are now treated as part of C. pungens subsp. pungens (neither subspecies is recognized). Deinandra (Hemizonia) corymbosa subsp. macrocephala is now treated as Deinandra corymbosa (no subspecies recognized). Deinandra (Hemizonia) increscens subsp. foliosa is now treated as part of D. paniculata. HEMIZONIA congesta DC. subsp. congesta HEMIZONIA congesta DC. subsp. lutescens (Greene) Babc. & H. M. Hall. HEMIZONIA congesta DC. subsp. leucocephala (Tanowitz) Keil HEMIZONIA congesta DC. subsp. congesta. MADIA madioides (Nutt.) Greene ANISOCARPUS madioides Nutt.